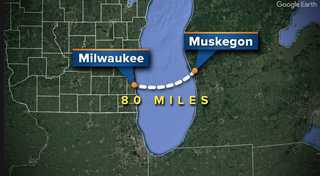 MILWAUKEE -- Two Michigan men hope to accomplish a huge feat, with your help. They want to paddle board, all the way across Lake Michigan. They hope to start in Milwaukee next month and spend about 30 hours paddle boarding to Muskegon, Michigan. They expect to top speeds at just four miles per hour, with a good headwind. Eric Strickler says he's doing this with a friend, to raise money to keep our great lakes clean. The money would go to the Muskegon Lake Watershed Partnership . He hopes their efforts will provide inspiration to all of us. "Invasive species is a pretty huge issue it has been for a long time... with zebra mussels," said Strickler. He knows he will have a view of the lake some may never be able to see. He claims to be prepared for any dangers. "Night illumination devices, glow in the dark compasses, lots of food and communication devices and satellite distress beacon in the event [something happens] fingers crossed that won't happen," said Strickler. The goal now is to find someone to follow alongside them in a chase boat, the entire way. "You can enjoy yourself as your motoring around," said Strickler. If you are interested in following their efforts you can click here to find them on Facebook.